One day Richard Bullock’s best friend, a lab mix named Buddy Bear, collapsed and would not get up. Buddy’s veterinarian found cancer and removed his spleen and one lobe of his liver. Post-surgery, Buddy was listless and not eating, so Bullock took him to the OSU Veterinary Teaching Hospital. Veterinary medicine has made extraordinary advances in the past fifty years. 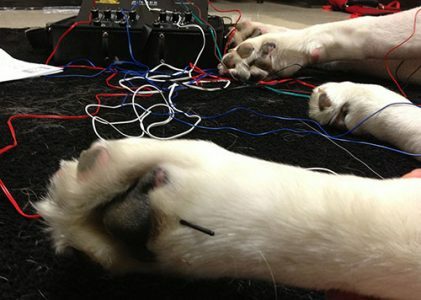 Animals can now receive many of the same high-tech diagnostic and treatment options as humans. From specialty surgery, to a broad range of safe and effective pharmaceuticals, these options have provided animals with longer, healthier lives. Now, similar to human medicine, there is a growing interest in adding alternative therapy options. Some veterinarians are now using therapies like acupuncture, chiropractics, and E-stim in conjunction with more traditional medicine. At the VTH, alternative therapies are available in many forms, and nowhere is this more visible than in the small animal rehabilitation unit. Typically, in any given week, all year long, the hospital performs eight or ten orthopedic surgeries, most of them for dogs with broken bones or back issues. Nearly all of these cases are referred to rehabilitation post-surgery. Depending on the type of injury, age and lifestyle of the animal, and other factors, doctors prescribe a rehab program that may include massage, exercise therapy, ultrasound, hydrotherapy, laser therapy, and more. In fact, patients at the VTH seem to have more post-op rehab options than many humans. Have you ever heard of a friend or relative who regularly used an underwater treadmill following knee surgery? The underwater treadmill room in the hospital is a busy place, handling lots of dogs with arthritis, as well as post-surgery dogs and cats. Underwater treadmills provide weight-bearing reduction while the warm water and exercise facilitates muscle relaxation and tendon stretch; they are used primarily to improve muscle strength and limb function. They also improve range of motion in compromised joints. The dogs like the water, the attention, and the treats. Dr. Mecham is also certified in veterinary chiropractics, which he most often uses for horses with symptoms that appear to be pain-related. For example, Dr. Mecham recently treated a horse who was having trouble chewing. The owner thought he had a broken tooth. “When he came to the hospital, the students fed him a treat. The horse tried to get it positioned in his mouth so he could chew it, but ended up spitting most of it out,” says Mecham. “I had just done a dental on that horse, so I thought a tooth problem was unlikely. I felt his neck and found the first vertebrae out of alignment. I did one adjustment, gave him another treat, and he chewed fine. The students were blown away,” he laughs. The Integrative Medicine Club at OSU is a group of students whose goal is to raise awareness of alternatives to traditional medicine. “We provide a lot of lunch talks,” says member Danielle Daw (Class of 2018). “We have brought in people to talk about Chinese medicine and holistic medicine. We had a raw food panel.” The raw food topic, in particular, pulled in a large audience, not all students. Both Clarke and Daw will soon be attending classes in Florida to obtain a certification in acupuncture. “People in the veterinary field seem to be surprised that we offer acupuncture at the VTH,” says Daw. “I think as it becomes more accepted in human medicine, it will do the same in veterinary medicine. 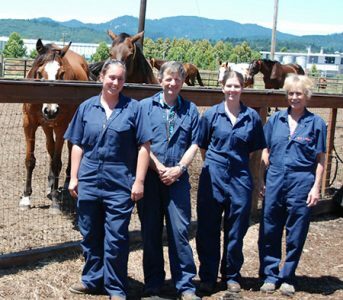 The team who keeps the OSU College of Veterinary Medicine farm running (L to R): Kasey Pedder, Peter McPartlin, Ashley Silkett-Butler, and Kim Veldman. On an average day, the large animal hospital houses 25-30 animals. Those animals receive stellar medical treatment from doctors and veterinary technicians, plus an extra dose of attentive care from fourth-year veterinary students. But who provides for their basic needs? A typical day for McPartlin and his team begins at 6 a.m. with the first hospital feeding. Then they clean and disinfect stalls. A couple of hours later, they can turn their attention to the teaching herd and farm chores. Afterwards, they go back to the hospital for the afternoon feeding. Between hospital patients and herd animals, the college goes through about 72 tons of hay per year, and about 20,000 pounds of feed or grain. Horses are, by far, the highest maintenance animals in the teaching herd. “You have a big animal that walks on four little legs, and when they are outside in a herd, they act like a group of teenagers,” says McPartlin. “They are always fooling around.” Sometimes, that creates more work for the farm manager. “Last month, a mare named Pearl was in a separate paddock with her best friend,” says McPartlin. “I put them there to eat down some grass. She decided that she didn’t like being there, and jumped the fence to be with the other horses.” The fence is four feet high, and Pearl is not a youngster, so she hit the fence and got a big knot on her leg. “I spent one morning fixing the fence she ruined,” says McPartlin. The horses also get extra care for their feet, from a farrier who comes once a month, and for their teeth, from Dr. Mecham, the herd veterinarian. In addition to animal care, McPartlin is responsible for keeping the basic operation running. He does everything from repair hoses in the hospital to changing the oil in the tractor. His team even keeps the hospital parking lot tidy. His advice often deals with the nuts-and-bolts of hospital issues, sometimes literally. “We have a commercial washer that gets messed up when people leave stuff in their coveralls. I’ve always got screws in mine. I try to remind everyone to turn their pockets inside-out before they stuff them in the laundry,” he says. That kind of positive interaction with people is something that McPartlin consciously strives to achieve. He sees it as part of the OSU mission to create an environment for people to grow. Ron and Marlene Izatt stopped by the college to have lunch with veterinary students Erika Wakabayashi, Melanie Peel, Jessica Rigling, and Laurel Anderson. A veterinary college is chock full of people who love animals. From highly skilled surgeons in the hospital, to investigators in the laboratories, to students who volunteer at shelters, they all work hard to provide the best possible lives for animals. Outside the college, but integrally connected, is another group of animal lovers: those who work as partners by learning about college goals, and providing the missing pieces needed to reach new heights of excellence. Ron and Marlene Izatt are that kind of animal lover. At home on their acreage in southeast Washington, they have two dogs and a horse, but in the past, they have had as many as four horses, four dogs, and four cats. It seems to depend on what their neighbors are up to. “The neighbor’s dog brought Miss Poppy home when she was about six months old,” says Marlene. “She ran with that dog for a month or two, but because she wasn’t potty-trained, they left her outside in the dead of winter. You can’t do that with a Chihuahua, so another neighbor took her home, and I offered to potty-train her.” One thing led to another, and Miss Poppy ended up a member of the Izatt family. Lucky dog. The Izatts also drove way out of their way to get their horse: about 300 miles to the Steens Mountains in southeast Oregon. There the Bureau of Land Management is desperately in need of adoptive families for their 40,000 wild mustangs. “I really try to get people to go there and get horses from them, because they are such awesome animals,” says Marlene. Now the Izatts are showing their love of animals by supporting veterinary students. Ron Izatt is an OSU alumnus, but he and Marlene were more familiar with the hospital at Washington State University, where they had received excellent care for their dog. They had been discussing ways to help support the WSU hospital, when a chance meeting with OSU Dean of Pharmacy, Mark Zabriskie, steered them in another direction. “He said, ‘But you are an OSU alumni; wouldn’t you like to help us?’” says Ron. Zabriskie gave them a quick update on the accomplishments of the OSU College of Veterinary Medicine, and encouraged them to investigate further. “I went on the internet to look up OSU Vet Med and I was really impressed,” says Ron. 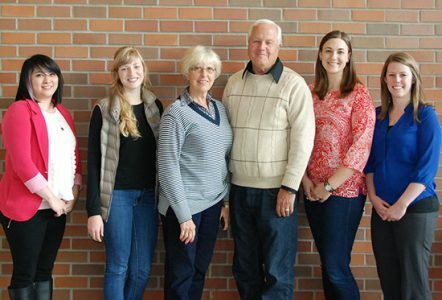 After several conversations with Development Director Kelley Marchbanks, the Izatts made a decision: as part of their estate planning, they have committed funds to establish the Ronald and Marlene Izatt Veterinary Endowed Scholarship Fund, which will provide a full-ride, expenses-paid, fourth year for an exceptional veterinary student. This estate gift will have a big impact on the future, but the Izatts also wanted to help now, so they provided additional funds to support a scholarship this year. Why did they choose scholarship funding? “Vet students have a tremendous debt, and don’t earn as much as medical doctors,” says Ron. In fact, the average debt for a graduating veterinary student in the U.S. is $150,000, and the average starting salary is $68,000. The OSU College of Veterinary Medicine works hard to provide scholarship relief for their students. In 2016, every student in the college who applied for scholarships, received some level of support. That could not have been done without friends like Ron and Marlene Izatt.